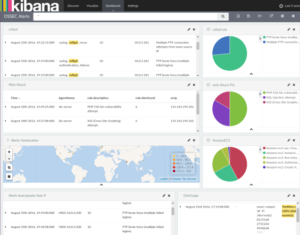 Let suppose one of our clients want us to monitor its infrastructure of more than 60 servers. Basically a centralized syslog server should do the work, but to analyze so much data, syslog wasn’t sufficient. Instead we installed OSSec. A host-based intrusion detection system (HIDS) is a system that monitors a computer system on which it is installed to detect an intrusion and/or misuse, and responds by logging the activity and notifying the designated authority. A HIDS can be thought of as an agent that monitors and analyzes whether anything or anyone, whether internal or external, has circumvented the system’s security policy. 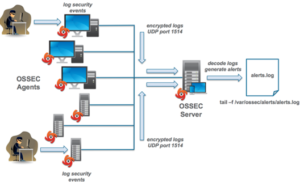 OSSEC is an Open Source Host-based Intrusion Detection System. It performs log analysis, integrity checking, Windows registry monitoring, Unix-based rootkit detection, real-time alerting and active response. * cover PCI-compliance requirements related to monitoring. 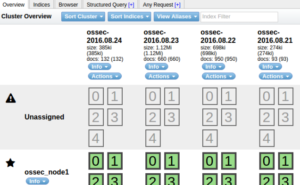 OSSEC utilizes a client/server architecture.It has a central manager for monitoring and receiving information from agents. The manager is the central piece of the OSSEC deployment. It stores the file integrity checking databases, the logs, events, and system auditing entries. All the rules, decoders, and major configuration options are stored centrally in the manager; making it easy to administer even a large number of agents. The rules only exist on the manager. All analysis is done on the manager. Agents do not send alerts to the manager, they only send the raw logs. Agent forward the logs to manager using port 1514 and server analysis those logs and store in alerts.log file . Follow the same process as above but Choose agent when being asked about the installation type and answer the rest of questions as desired. After Setting up agent we need to Connect it with OSSEC-Server . The complain more often about OSSEC is related to how hard it is to setup the authentication keys between the agents and the manager. Each agent share a key-pair with the manager, so if you have a thousand agents, you need a thousand keys. To make life easier, OSSEC added a new daemon on the manager, called ossec-authd. when you have finished to deploy, you stop it. That’s it. The keys are now exchanged and you can start your agent. First, a look at the /var/ossec directory. It is composed of several subdir; most important sub-directories for the moment are: etc, logs and rules. need to write your own rules, you will edit the “local_rules.xml”. 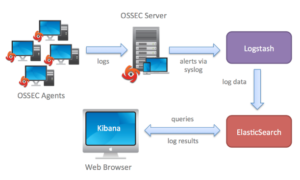 Integration of our OSSec with ELK Stack, for long term data storage, alerts indexing, management and visualization. If you want to remove an OSSEC agent from the server, use the ‘R’ option in the manage_agents sart screen. You will be given a list of all agents already added to the server. To remove an agent, simply type in the ID of the agent, press enter, and finally confirm the deletion. It is important to note that you have to enter all digits of the ID. "Thanks for the article. 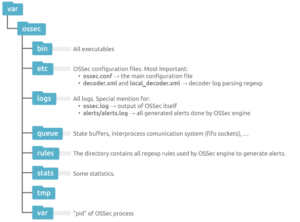 I am new to OSSEC and have been newly exploring this so this is really helpful. I have a question - Does the host containing OSSEC manager/server need an agent as well? or the server does the job of log collection as well? ".